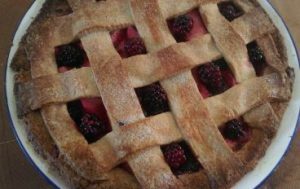 Blackberry and Apple pie! – Create, Make & Bake! Warning: This a somewhat difficult recipe, especially to beginners. Although I found it fun to make, I got worried it wouldn’t work a few times. I turned out well although my grandad reckons I needed more sugar and I agree with him, the blackberries are more bitter than I had expected. At LEAST 35g caster sugar, I would go up to 45g if I were you. First day It was bitter but the day after It wasn’t. 1. Roll out pastry on a floured surface and fit into a pie dish, Blind bake at Gas mark 5/190*C/ 375*F for 20 minutes, then bake normally for a further 10 minutes. Leave to cool. 2. Put the apples in a bowl and microwave for 3 minutes. Take it out and add the blackberries, sugar and cinnamon. Mix well. 3. Don’t drain, put put all the mixture in the pie base. Use any extra (or make more pastry) to make the top. Picture below for the design I went for. Brush top with egg to help brown nicely.